An exciting, fast-paced fantasy that has unique elements of magic and nature. 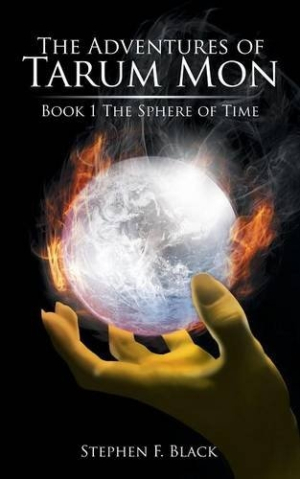 Dragon riders, sorcerers, and heroes unite in The Adventures of Tarum Mon: The Sphere of Time, first in a new high fantasy series from Stephen F. Black that is charged with magic and nonstop action. There is a mysterious dark thrall spreading throughout the forests and towns of the land known as The Rith, and eighteen-year-old Tarum Mon, an ambitious elven spell caster and archer, is tasked with discovering its source. Collecting friends and allies along the way, Tarum’s quest pushes his newfound band of champions to their limits as they leap headfirst into dangers, traps, and enchantments. Tarum’s adventures are relayed in a unique storytelling style, using an omniscient narrator and very little actual dialogue. Thoughts and conversations are typically insinuated, as in, “Tarum asked if she was in town long and then invited her to the tavern for a drink.” Points of view switch randomly as Tarum’s core group of travelers shrinks and expands, with sidekicks like Blade the Masterful and Serenity, Ember Mistress. Together, they lead an entertaining subplot that is focused more on romance and freeing captive dragons than it is on the initial journey’s goals. The spells are plentiful and colorful—literally, with names like Violet Spinner, Rainbow Ricochet, and Golden Grip—while numerous battles involving clashing swords, magic attacks, and a menagerie of deadly beasties ensure that the action is front and center, carrying the plot forward with bright imagery. Chapters are labeled by season and day, with the first portion taking place in The Rith over twelve days during the season of Brightleaf. Each day receives a chapter. Not many clues indicate Brightleaf’s unique characteristics, forcing the inference of a spring or summer equivalent via the weather. The function of the heading remains unclear, though it is stated that the seasons will play a significant role in upcoming sequels, providing a fuller picture of Tarum Mon’s world. The Adventures of Tarum Mon is an exciting, fast-paced fantasy with unique elements of magic and nature, a variety of brave new champions with differing skills and interests, and just a dash of romance and heightened emotions to spice up the continuous trials of Tarum Mon as he travels through The Rith.